Prestige Stone is one of the areas first granite fabricators and has four generations of experience in the stone industry. Since we own our manufacturing facility and do not outsource, we have a better selection, higher quality and lower price than our competitors as well as the best customer service in the industry. We fabricate all of todays hottest products including but not limited to; granite, quartz, marble, travertine and soapstone. Whether you are looking for a countertop, fireplace, vanity or Jacuzzi we have you covered. Our staff will educate you on our offerings and guide you to a product that fits your style and needs as some products are not suitable in certain applications. We provide homeowners, contractors and architects a large choice of custom fabricated stone slabs forresidential or commercial use. Our staff of experienced, professional and knowledgeable stone experts help you select products, estimate costs, work with you on design ideas and follow through with personalized project management. Granite is a natural product and contains concentrations of crystals, pits, veins and fissures (small hairline cracks) that are likely to be present in solutions of the slab(s) used to produce your counter tops. When selecting your material we have slabs on site as well as multiple suppliers we can utilize in our immediate area to find the style you are looking for. Our slabs and suppliers are handpicked by the owner of the company. His goal is to bring to you the most beautiful, exotic colors the world has to offer. We also are proud to offer Caesar Stone, Silestone, LG quartz, Cambria quartz surfacing as well as some private label brands. 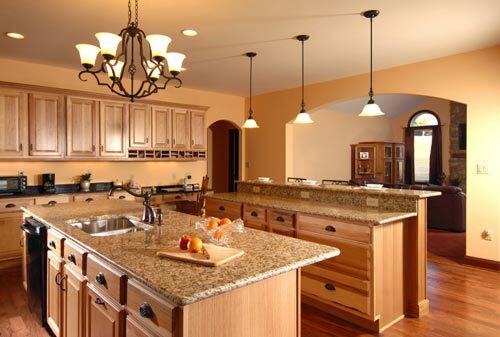 With durability close to that of natural stone it is also an excellent choice for kitchen tops. Also offered at our showroom is a wide range of flooring in ceramic, porcelain and stone as well as sinks and faucets. Through the four generations of our family working in the stone business we have perfected our craftsmanship. Since many of our employees are members of the family and the rest with our company for many years, we take personal pride in each completed kitchen. From start to finish each kitchen undergoes many quality control checks. From the start every slab that comes in is inspected for open fissures (small cracks) and unsightly marking. If any are found, these slabs are rejected and sent back to the quarry, instead of being kept for a discount. Once the slab moves into the fabrication facility our skil led craftsmen that have been with us for many years begin to fabricate your job. Once it is completed the shop foreman and manager inspect it and once it has passed we load it for install. Once at install date all pieces are put in place and a final rundown is performed by the install manager and you have a beautiful new granite kitchen!